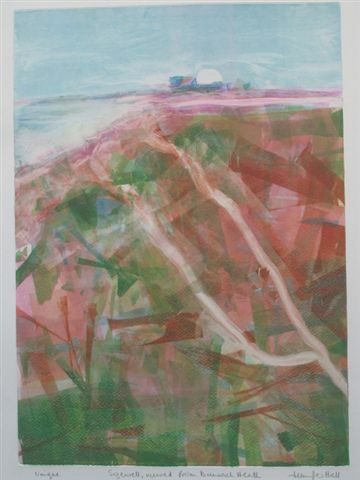 A collective of six artists, two writers and a photographer are working to paint, draw, photograph, print, collect, sculpt and write the Suffolk Coastline from Covehithe to Felixstowe. Many of us have an emotional connection with the sea. It can be seen as a symbol of birth, of transformation, of death and of life; it represents our unconscious. Throughout history, the oceans and seas have fed us and offered a way of exploring the world. Yet the sea can also take lives, change coastlines and destroy communities. It is a natural element, but not a neutral force and, as much as we may wish it, the sea cannot be made static or controlled. Its power, both positive and negative, can only be understood retrospectively, by capturing the trace of where it has once been and the effect that it has had. Tidal Margins is concerned with narratives – both visual and written – that connect people and place. History, memory, imagination, the past and the present are all woven together to offer a new way of seeing the skyscapes, seascapes and landscapes of the Suffolk coast.